Mercedes have been producing an SL (Sport Leicht) model or range of models since 1954 when the landmark 300SL was unveiled. The similarly styled, but mechanically unrelated, 190 followed in 1955, completing the first generation of cars. Their successor was the W113 series SL, which proved to be more comfortable than the former and faster than the latter (a point emphasised by Eugen Bohringer's 1963 Liege-Sofia-Liege rally victory). The rarest W113 variant, the 250SL, was officially introduced at the March 1967 Geneva Salon. Blessed with the same effortlessly elegant Paul Bracq styling as its earlier relations, it was powered by a new seven-bearing crankshaft 2496cc SOHC straight-six engine that developed some 150bhp and 159lb ft of torque. Equipped with all-round independent suspension and four-wheel disc brakes, its 'square' track gave notably sure-footed handling. The build quality of the W113 range is much admired to this day and Mercedes certainly didn't stint on solidity. As a result, the cars were certainly heavier than most of their peers, despite the use of aluminium for the boot lid, bonnet and door skins. Able to blur the divide between city streets and open roads with ease, the majority of 250SLs were specified with four-speed automatic gearboxes. The SL was available in 'Californian Coupe' (2+2-seater), 'Convertible' (2-seater) or 'Coupe Convertible' (2-seater) guises, the last of which came with both a soft-top and the famous 'Pagoda' hardtop roof (so called because of its gently scalloped centre section). Faster than the 230SL which preceded it yet stiffer-sprung and more agile than its 280SL successor, the 250SL remained in production for just a single year accounting for a mere 5,196 sales worldwide. This left-hand drive 1967 250SL has been in the same ownership since 1972. Reputedly "rust free", it has recently been treated to extensive refurbishment. This is said to have included: an engine service with the fitment of new plugs, points, filters etc; an overhaul of the braking system and replacement of the calipers etc; the reconditioning of the fuel metering unit and overhaul of the fuel system and tank. Cosmetic improvements included: the provision of new seat covers and square weave German carpets; the replacement of various items of chrome trim; the fitting of a new hood, Becker radio and tyres all round. 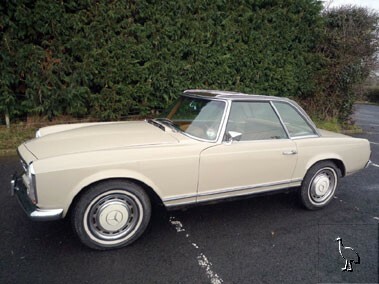 The car, which has recently been resprayed, is finished in beige with Cognac-coloured trim and would appear to be a very tidy example of the rarest version of the 'Pagoda' breed.